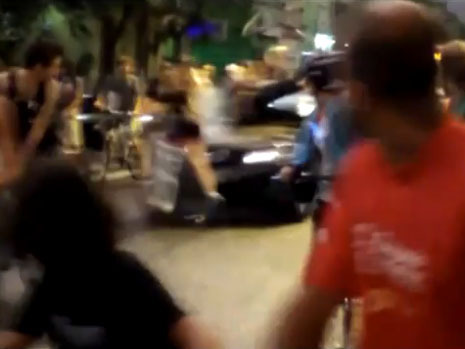 (CBS) - At least 16 bicyclists in a Critical Mass ride event in Porto Alegre, Brazil, were injured after a driver in a VW Golf car drove into the group at high-speed. According to Sky News, the driver of the car, 47-year-old Richard Neis, has been apprehended by police and is claiming self-defense after being threatened by some of the cyclists. Critical Mass, a world-wide bike protest that typically occurs on the last Friday of each month, has had similar incidents of aggression occur in the past to some of its bikers. One of the most famous incidents occurred in 2008 when an officer with the NYPD, Patrick Pogan, was caught-on-camera shoving a protester from his bicycle, leading to a large public outcry and investigation. Pogan resigned from the NYPD in the aftermath, and was later acquitted of a reckless assault charge, but found guilty of filing a criminal complaint containing false statements about the incident. For more stories that you just need to see go to CBSNews.com's video blog "The Feed."